Asian Journal of Instruction is an international, double-blind, peer-reviewed, open access journal that publishes original research articles, reviews, compilations and translations aiming to contribute to the field of education. The journal is published online at least twice a year, in June and December. The journal primarily aims to publish scientific studies focused on curriculum and instruction and teacher training areas. But, articles on the field of educational sciences are also accepted. 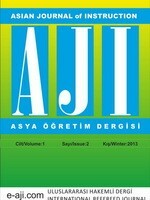 The language of the journal is Turkish and English. Asian Journal of Instruction adopts open access policy. The open access policies adopted by Asian Journal of Instruction can be found at http://www.budapestopenaccessinitiative.org/boai-10-recommendations. Asian Journal of Instruction do not request any charges for an author to process or publish a paper. Asian Journal of Instruction claims no fees from any library or reader for article review or printing and for access to electronic articles published in journal. All content is freely available without charge to the user or his/her institution. Asian Journal of Instruction entitles all parties to read, download, copy, share and redistribute all the articles, data sets, figures and supplementary files published in this journal in data mining, search engines, web sites, blogs and other digital platforms under the condition of providing references without asking prior permission from the publisher or the author. The journal is indexed by many national and international indexes, has been published for more than five years and is considered within the scope of academic incentives. Asian Journal of Instruction will be happy to publish the qualified work of your valuable scientists.